NCTE ITEP 2019: The National Council For Teacher Education (NCTE) has introduced the programme of 4 years with the aim of achieving the overall development in the quality of teaching. The purpose is to enrich the teaching quality in schools and the ways the aspirants must learn the ways of engaging the students in the classes. The NCTE has proposed to launch the 4 years Integrated Teachers Education Programme (ITEP) with the best teachers practices in the world. The applications for the four-year program from the Composite Institutes will be invited from 3rd December 2018 and the last date for the submission will be 31st December 2018. The introduction of this new course will be from the session of 2019-2020 and it might replace the B.Ed or D.El.Ed degree. The course of 4 years will include the thorough teachings of enhancing the understanding of the students and the ways through which the engagement programs can make the learning easier for the students. The candidates will have to go through the instructions of the University or colleges which will be offering this course of four years. Go through the basic details of NCTE ITEP 2019 from the article below. NCTE is inviting Online Applications from COMPOSITE Institutes from 3rd December 2018 to 31st December 2018 in order to acquire a recognition/permission to 4 years Integrated Teacher Education Programme (ITEP) for the academic session 2019-2023. National Council of Teacher Education has released the official notification: Read complete notification below. The basic unit shall comprise of fifty students each in the programme. The institution shall be permitted to opt for units of either Arts stream or Science stream, or both, in case the institution is eligible for more than one unit. Candidates with formal education from a ‘School’ as defined in clause (n) of section 2 of the Right to Education Act, 2009, with at least fifty percent marks in Senior Secondary or plus two examinations or its equivalent, are eligible for admission. The relaxation in percentage of marks in the Senior Secondary or plus two examination or its equivalent examination and in the reservation for Scheduled Caste or Scheduled Tribe or Other Backward Class or Persons With Disabilities and other categories shall be as per the rules of the Central Government or State Government or Union Territory Administration, whichever is applicable. The Application Form of Integrated Teacher Education Program (ITEP) will be released by the conducting Universities or the colleges who will be offering this four-year course. The filling up and the submission of the Application Form will be an important part of the admission procedure which every candidate has to follow. The availability of the forms might be in an online or in an offline mode or the conducting body can go for both the modes of the Application availability. The candidate who will be applying for this course will have to provide the details as asked in the Application Form and must make sure that the information provided in the Application is valid and correct, the form will not be accepted otherwise. The University who will be offering this course will also be releasing an Information Brochure along with the Application Form as per the scheduled date announced by the examination conducting body. The aspirants who will be filling up the Application form are advised that they must go through the details and other instructions mentioned in the Brochure very carefully given that this is a newly introduced course and the candidate must avoid any form of error while filling up the Application Form. The final submission of the Application will only be after the payment of the Application fee. With the introduction of the Integrated Teacher Education Programme (ITEP) by National Council of Teacher Education (NCTE), the criteria, as well as the procedure of the admission, has also changed. As per the eligibility criteria mentioned above, the candidate who will be applying to pursue this course of 4 years must have passed the 12th standard exam with a minimum of 50% marks. There are two Units of Arts Stream and the Science Stream. Each Unit will have 50 seats and Institute will be allowed for the admission of 50 candidates, if they are offering any one or both the units. Admission shall be made on the merit basis, considering marks obtained at Senior Secondary or plus two level or equivalent examination or in an entrance examination, or any other selection process as per the policy of the University or State Government or Union Territory Administration. At the time of admission to the programme, the candidate must indicate the subject in which he or she proposes to take the B.A or B.Sc Degree. Admissions shall be on the basis of the order of merit and availability of seats. Any change in the choice of subjects shall be made within one month from the date of commencement of the programme. It will be as per the University or the Institute offering the Admission to the course that they will be conducting the entrance examinations or providing the admission through the Merit. In case if the University will be offering the admission through an entrance, they will also release the Hall Ticket or the Admit Card which will be available on the official website and can be accessed by the candidates who have submitted the Application successfully. The purpose behind the introduction of Integrated teacher Education Programme is to train the aspirants who are planning on pursuing their career in teaching. They must be aware with the methods which can make the teaching much more enriching and the ways through which the engagement with the students can increase. The curriculum of ITEP 2019 will include such ways in theory as well as in Practical. The candidates who will be planning on appearing for this exam will have to make themselves aware with the defined curriculum which will be set up by the university or the Institute offering this course. The guidelines will be as per NCTE. Knowing the curriculum will make the candidate prepared for the course of 4 years. The curriculum and the implementation of the programme will be based on the model curriculum developed by the NCTE. The concerned Universities or Institutions conducting this programme may adopt or modify this model curriculum, as per the local requirement for the conduct of this programme with prior approval of the NCTE. The Result of the Integrated Teacher Education will be announced by the examination conducting body of the University or the Institute who will be offering this course of 4 years. As per the notification released by National Council of Teacher Education, the Universities who will be authorized to offer this course must have Arts Unit or Social Sciences Unit or both the Units. Each unit will be provided with 50 seats and the procedure of the admission will be as the guidelines defined by the University. The basic eligibility to apply for the programme is 50% marks to be secured by the candidate in the qualifying examination. The examination conducting body might conduct an entrance exam of the candidates who will be applying for the course or can also grant admission by releasing the Merit List on the basis of the marks secured by the candidate in the qualifying examination. The Result will be available as per the dates announced by the examination conducting body of the Institute for which the candidate will be applying. What is the Composite Institution? National Council of Teacher Education will be allowing the Composite Institutes for offering Integrated Teacher Education Programme. The Application Forms are invited from Composite Institutes from 3rd December 2018 to 31st December 2018 for grant of permission/recognition for 4 years Integrated Teacher Education Programme. The Composite Institution is the constitutionally recognized higher education Institution offering the UG and PG courses in various fields like Arts, science, Social Science, Commerce. The mode of the admission to the Institutes will be as per the guidelines defined by the Universities which will be permitted to offer this course. In order to apply for this course, the candidate must have secured 50% marks in 12th standard. This newly introduced course of 4 years might create confusion among the students who will be applying for this programme. It is important that before proceeding for the admission to this course or filling the Application Form, the aspirants are aware of the basic details and the instructions related to the course including the duration and the procedure of the admission. We have mentioned few of the points below for the applicants who are planning on pursuing this course. 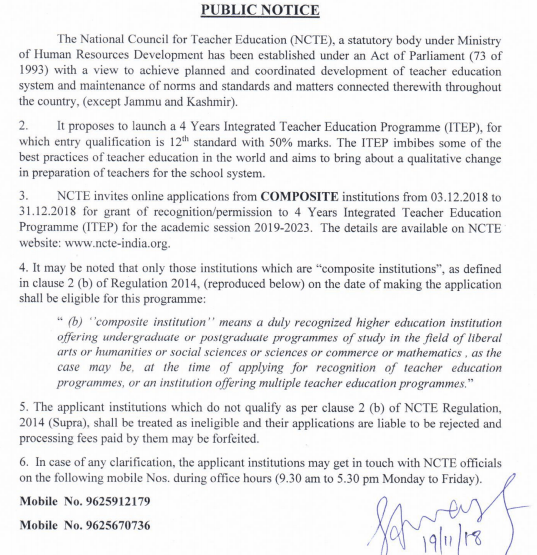 Composite Institution: National Council For Teacher Education (NCTE) in its officially released notification is inviting Applications from Composite Institutions from 3rd December 2018 to 31st December 2018 for grant of permission/recognition to 4 years Integrated Teacher Education Programme for the academic session 2019-2023. Only recognized Institute will be provided with the permission of offering this 4 year course. Duration: The Integrated Teacher Education Programme (Arts and Science streams) shall be of four academic years comprising eight semesters, inclusive of field-based experiences, teaching practice and internship. Any Student-teacher who is unable to complete any semester or appear in any semester–end examination, shall be permitted to complete the programme within a maximum period of six years from the date of admission to the programme with the approval of the Managing Committee. Working Days: In a semester, there shall be at least 125 (one hundred and twenty-five) working days and a minimum 840 (eight hundred and forty) working hours, excluding the period of examinations and admissions. Total working hours shall be a minimum of 40 (forty) hours to be spread over one week. The minimum attendance of student-teachers shall have to be eighty percent in all courses and ninety percent for field-based experience or school internship or teaching practice separately. Application Form: The submission of the Application Form is an important procedure. The availability of the Application in order to apply to the course will be as per the guidelines of the University offering this course. Universities and Institutes all around the country offer B.Ed course of 2 years. With the introduction of this latest programme, there are chances that the B.Ed course offered by the various educational institutions will be replaced by Integrated Teacher Education Programme which will be a four-year course and the minimum eligibility to apply for this programme will be that the candidate has to pass class 12th exam and must have secured 50% marks. In the table below we are providing the Detailed information of the B.Ed program offered at the state level by different Central and the State Universities. Click on the link for the detailed article regarding the entrance examination and other relevant information. Abhi koi information nai aayi hai. We will update it soon. Abhi koi detail nai aayi hai. we will publish it as soon as it is released. 50% marks in the class 12 exam are eligible to apply for ITEP. Programme will only be offered in Science and Arts streams. Will it be National Level NCTE ITEP EXam? No, NCTE has launch the 4 years Integrated Teachers Education Programme (ITEP). NCTE ITEP information brochure will be released on December 3, 2018. 6 What is the Composite Institution?